This entry was posted in Guide, Pages on 2015-07-23 by admin. How to create an info file to the module? There is $inc object that allows you to store information about modules. Module information system can move as follows. This saves the information about the module to RAM during execution of the script. Information will be publicly available throughout the system. This entry was posted in Basics, Examples, File system and tagged info, module, mymodule on 2015-05-17 by admin. PHP code needs to be divided into multiple parts? Use OpenSencillo modules. You can then create logical units separate from the source code yourcode.php. Create folders that will have the name of your module (for example: mymodule). At least one file in the folder must contain the name. Open folder mymodule and create info_mymodule.php, install_mymodule.php and main_mymodule.php. If you not use prefix, lib_identificator.php bootup module as basic code without installer. Add to info_mymodule.php simple information about module. 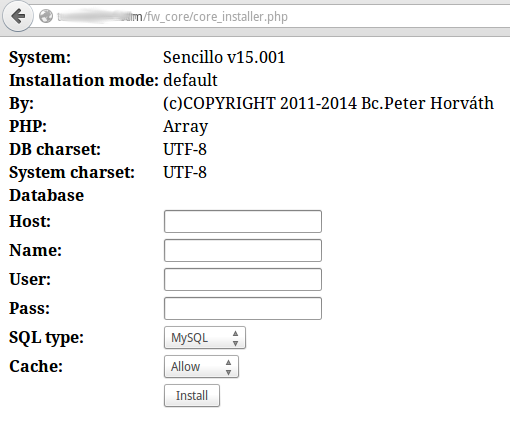 Enter code to install_mymodule.php to install the module database tables, and other code needed for installation. Use main_mymodule.php to insert any code that need to be separated. Code shall be made for the introduction OpenSencillo. 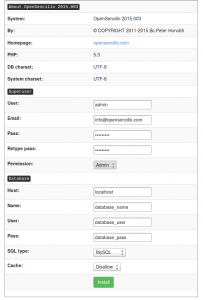 Question: When OpenSencillo connect the module? Question: Can I move code from yourcode.php into modules? 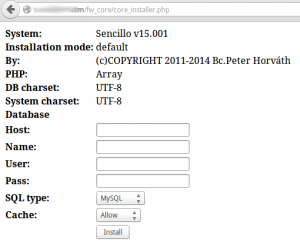 This entry was posted in Basics, Examples, File system and tagged boot, module, yourcode.php on 2015-05-17 by admin. Now you save new id, new unique ip with date and time. 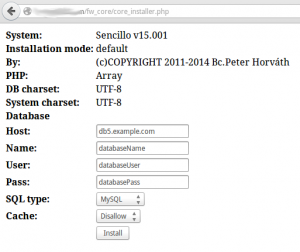 This entry was posted in Basics, Examples and tagged database, sql, table on 2015-05-12 by admin. 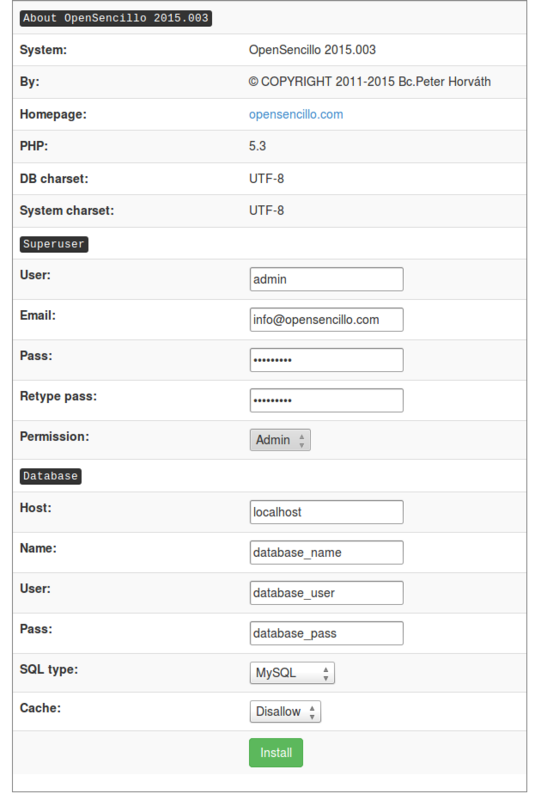 Upload sencillo to the root directory on your server. This entry was posted in Basics, Guide, Pages on 2015-02-15 by admin. 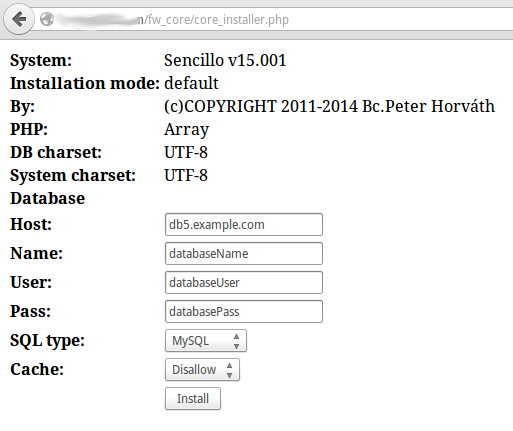 File system after OpenSencillo installation. fw_modules – destination for custom modules. If you write new module, save it here. yourcode.php – if you write main code for your webpage, save it here. It is most important file for all your projects. This entry was posted in Basics, Examples, File system on 2015-01-28 by admin. You can add pretty debug. This tool not work correct if your server using PHP xdebug module. Check example.com with your first pretty debug. This entry was posted in Debug, Examples and tagged Debug on 2015-01-26 by admin. After installation you can write your first webpage. Fill in all fields and set Cache value to Disallow for programming without cache. This entry was posted in Basics, Guide, Pages on 2014-12-01 by admin.